The second Wild Images photo tour of Madagascar was another great success, resulting in some even better photographic encounters with some of the ‘Eighth Continent’s’ most enigmatic wildlife than last time. From the outrageously confiding Long-tailed Ground Roller of the Spiny Forest of southwest Madagascar, found nowhere else in the world, to the equally tame Ring-tailed Lemurs and Verreaux’s Sifaka of Isalo National Park. Zombitse National Park produced day roosting White-browed Owl, Appert’s Tetraka and Giant Coua. We also filled our cards with images of the impressive Fosa – a lemur hunter and Madagascar’s largest carnivore in the dry deciduous Kirindy Forest of the west coast, this time even being treated to some tree climbing photo opportunities. Also here were more Verreaux’s Sifakas, another star attraction allowing point blank approach. Madame Berthe’s Mouse Lemur, the world’s smallest primate put in a couple of appearances for the cameras along with Narrow-striped Mongoose and Giant Jumping Rat (although the latter was rather out of DSLR range). A massive Hog-nosed Snake and some very tame White-breasted Mesites were also memorable in Kirindy Forest. The nearby Baobabs Amoreux and Avenue of Baobabs also got a lot of attention. In the eastern rainforest at Andasibe we again marveled at Indri, the largest extant lemur. This was a sound as well as sight experience, their far-carrying eerie singing calls ringing through the forest. Other terrific lemur encounters in the east included the naturally occurring and critically endangered Diademed Sifaka, Black-and-white Ruffed and Red-bellied Lemurs in Mantadia National Park.  This year we managed to photograph some of the eastern rainforest’s other special wildlife including the cryptically plumaged Scaly Ground Roller and Collared Nightjar. We also added to our list of chameleon species, which this time included Antimena, Oustalet’s, Parson’s and Warty and were even treated to a great look at the weird Lesser Hedgehog Tenrec, a convergent-evolved hedgehog-like creature. Our Northern Madagascar extension took us to the remote forested region of Daraina where we had some stunning encounters with family groups of the critically endangered and incredibly beautiful Golden-crowned Sifaka as well as the endangered Crowned Lemur. Sadly again there was no Aye-aye here, except for some recent evidence in the form of their workings on tree trunks. Our final destination was Montagne D’Ambre, where we ended the tour with more stunning chameleons including Arthur’s, Mount Amber, Panther and Petter’s. After almost three weeks in country we felt we had seen a lot of Madagascar and had photographed another very good representation of its special fauna and flora. After a somewhat shaky start even ‘Mad’ Air started to operate vaguely on time! There were also some very memorable accommodations in awesome settings as well as some delicious food! Something Madagascar is not usually renowned for but there are very notable exceptions. Sadly I cannot say anything positive about Madagascar’s road network, except that it is worth enduring for the wildlife riches at the end of each journey. We will be back again in 2019! Once the rest of our group had all negotiated the very time-consuming immigration at Antanarivo (or simply ‘Tana’) airport, we made our way to our comfortable little airport hotel, a haven that we would return to three times later on our tour as we used the capital as a hub to fly to other destinations rather than risk the infrequent and notoriously changeable flights between the provincial towns we needed to reach. Air Madagascar (affectionately known as ‘Air Mad’) again lived up to its nickname and presented an eight hours delay to us on the first full day of the tour. With insufficient time to arrange an alternative programme, we whiled away the delay in Tana. Our flight to the southwestern town of Tulear (or Toliara) finally took off and before too long we were winding our way through deep puddles (there had been a terrific storm here a couple of days earlier, weren’t we glad that it did not fall on us? ), hordes of rickshaws and general hustle and bustle of the main town of the southwest. Eventually we reached our lovely beach hotel, passing a mangrove sunset along the way. Our programme varies depending on when Air ‘Mad’ bother to fly but this time we arrived early enough to allow a night walk in the legendary Spiny Forest near the coastal village of Ifaty. It was a novelty for the first photo session of the tour to be a flash photography one this time. Walking into the Spiny Forest is to enter a completely different and unique habitat, dominated by large squat and bottle-shaped Fony Baobab trees between which grow a sea of thorns in the form of Didierea Octopus Trees, this was even more surreal in the moonlight, with the Milky Way clearly visible in the night sky and the Southern Cross on the western horizon. The night walk was incredibly productive and kicked off immediately with two Grey-Brown Lemurs and a White-footed Sportive Lemur. Although neither were particularly photogenic it was nice to start with representatives of Madagascar’s special mammal family. Two wonderful Antimena Chameleons, endemic to southwest Madagascar, were in the same bush near the entrance to the reserve and soon afterwards we were ‘treated’ to a Hissing Cockroach, actually fabulous large and colourful creature, which obliged with some hissing as well. However, the star of the walk was a Lesser Hedgehog Tenrec, which posed nicely for all in the spotlight. It is amazing to think that this hedgehog lookalike is not even in the same order let alone family as Hedgehogs but instead is a product of convergent evolution. A Mafahaly Snake also posed nicely in a foot hold of one of the enormous Fony Baobabs, a venomous White Centipede and a small black scorpion were also found and a Madagascar Ground Gecko completed a very interesting line up, with loads of good subjects and something for everyone. After a great start like this we retired to a lovely meal at our seashore hotel to the sound of Madagascar Nightjars, a ubiquitous bird that we would see at almost every other place we visited. Their stuttering call became a familiar sound at dawn and dusk over the next couple of weeks. The following morning we were back again in the Spiny Forest where sadly the six Subdesert Mesites had chosen an obscured branch on which to roost so no frame filling photo this time before they exploded after sunrise and went their separate ways for the day. However, the main focus of our time here was Long-tailed Ground Roller and although it is the probably the easiest to see of the five Madagascan ground rollers it is still a challenge to photograph with a nice backdrop free of distracting twigs and branches. Our guides managed this once again in a spot where we could lie down for a lower aspect. Fantastic stuff! Next up was Running Coua and we knew what to expect now, another grandstand performance! Again this one was a piece of cake as it scuttled along the floor of the spiny forest. This time the birds were a bit closer and an effective focal length of around 400mm was probably ideal. A day roosting Madagascar Nightjar allowed some crazy close approach and happily we left it where we found it. Already another cracking photo session included a Sickle-billed Vanga against a lovely mossy backdrop and both the truly gorgeous Standing’s Day Gecko and Three-eyed Lizard on the path in dappled sunlight. There were a few other more distant/record shot bird subjects this morning like Red-tailed Vanga, Common Newtonia, Madagascar Bulbul, Thamnornis, Stripe-throated Jery, Madagascar Magpie Robin and Red Fody. Additionally the recently released reintroduced Ring-tailed Lemurs allowed a few shots as did the still captive Radiated Tortoises in their pen near the reserve entrance. It was hot and sunny by mid morning in glaring overhead sunlight with 0% cloud cover so we headed back to base for a break. Passing some salt pans we spoted a Humblot’s Heron, another Madagascar endemic, amongst the more numerous Striated Herons and Great Egrets. Back at our hotel lunch was interrupted by colourful Sakalava Weavers in the hedge next to the restaurant area. The afternoon session kicked off in style with bonkers close views of Madagascar Plover at the salt pans. Normally much less confiding than this but our ‘softly softly’ approach worked and everyone was able to get very close to it. I am thinking that the recent rain may have sparked an invertebrate larva bonanza, which the plover was taking advantage of on a newly flooded patch of marsh by the salt pans? Next up was a series of lakes where we were able to take some Greater Flamingos take off shots, as they moved a few tens of metres away from us. There were numerous shorebirds here as well such as Curlew and Common Sandpipers, Kittlitz’s Plover, Black-winged Stilt and Common Grenshank but none close. The highlight of this spot was a Madagascar Giant Swallowtail, which uncharacteristically landed and allowed everyone a chance to take some perched shots of this spectacular butterfly. We ended the session with a mangrove sunset, some of our folks taking some lovely photos of the sailing fishing boats returning to the shore against lovely golden light. Another night walk in the Spiny forest primarily for Milky Way/night sky photography hardly produced a single nocturnal critter now the temperature had dropped later in the evening. It really is critical to be there just after sunset if you want to see the night creatures! Annari found a couple of scorpions with her UV light, one of them sadly trodden on. It was also her birthday and featured the most memorable ever ‘Happy Birthday to you’ serenade I have ever heard delivered by the lovely guys at the hotel. An earlier schedule change by Air ‘Mad’ had meant we had an extra night at Ifaty and therefore an extra morning, which we spent in the Spiny Forest again for Long-tailed Ground Roller, although the performance was much as the day before and did not add anything other than another chance for folks who maybe did not move their AF point to the bird’s head when it filled their frames? A Malagasy Kestrel posed nicely on a didierea stem and a red-tailed Vanga sang in a nearby tree before it was time to leave. Passing by the salt pans one last time afforded a closer look at the Humblot’s Heron as well as a chance for Greater Painted Snipe (tricky/brief) and Namaqua Dove (much more obliging). I do not usually mention meals unless they are outstanding but our next lunch was in Tulear. Le Jardin is a very attractive Italian run restaurant serving up a bewildering array of very tasty food. We were absolutely full up when we finally left for the next leg of the journey to Isalo! We passed by insanely overladen taxi brousses (‘country taxis’) and numerous zebu carts laden with firewood. The lovely forests were still being carried away before our eyes. Barren knackered grasslands were formerly crop fields, abandoned and left to slowly go back to nature although we did see the occasional cotton crop along the journey. Children played in the shade of mango trees and one village we passed through had a large rum distillery, the produce of which is for sale at the roadside in plastic water bottles. Goodness knows what ABV it was, Armel thought maybe more than 50%. As we headed east we started to see impressive Western Baobab trees (Adansonia za) as well as Western Baobabs (A. madagascariensis), typically with more branches on their trunks. We also passed through Madagascar’s main sapphire mining area. Wild west type, one street towns, full of young men with rather grand Asian sapphire dealers’ shops here and there. Pausing briefly at Zombitse to look at some roadside birds produced Madagascar Harrier Hawk, Lesser Vasa Parrots and both Madagsacar Starling and Green Pigeons. As the sun set behind us we passed by the first of many Bismarck Palms, another endemic tree as we neared our destination. Ooh la la! 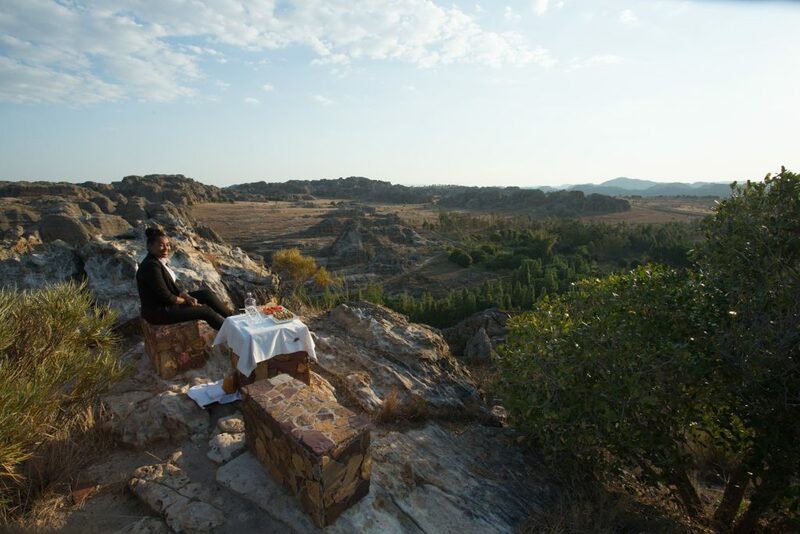 Our hotel at Isalo is definitely worth a mention, the best of the tour by miles and set in a wonderful location overlooking a fascinating weathered sandstone landscape, it was nice to roll up here after a long day. There is no need to arrive too early at Isalo NP as the lemurs do not descend to the bottom of the canyons, where they can be seen at close quarters, until late morning. Instead we spent some time before breakfast admiring the sandstone landscape by the hotel and seeing the localized Benson’s Rock Thrush and many of the lovely yellow-flowered Elephant’s Foot plants (Pachypodium rosulatum) blooming on the rocky outcrops. After a short hike in the lemurs appeared right on cue, first a family group of gorgeous Ring-tailed Lemurs, followed soon afterwards by a single majestic Verreaux’s Sifaka. The ringtails were a little tricky to photograph, often obscured by branches or in tricky positions but with a little patience… ditto re the Verreaux’s Sifaka, one of only a mere handful in the national park here. The lemurs were more focused on feeding than lounging around. We also saw a nice day roosting Torotoroka Scops Owl (albeit against the light) and this morning 70-200 or 100-400 were ideal lenses. Other photo subjects this morning included White-throated Rail, Malagasy Coucal, Olive Bee-eater, Chabert Vanga and Madagascar Paradise Flycatcher, as well as our first Oustalet’s Chameleon but these were a little high in the trees for our DSLRs. It was another hot and sunny day in southern Madagascar! The afternoon was a short sunset session from the viewpoint above the hotel where I inadvertently crashed someone else’s sun-downer. Well the drinks and nibbles looked like they were for everyone and there were more glasses than people so… oops! An early start next day saw us heading back west towards the coast again. The regular stop at Zombitse National Park produced White-browed Owl at a day roost but typically against the sunlight, of course owls rarely roost looking into the sun. This was followed by gorgeous Standing’s Day Geckos around the ticket office roof and then a magnificent Oustalet’s Chameleon, the biggest of all the chameleons, that posed so well for us under the shade of the forest canopy. Other stars of Zombitse were Hubbard’s Sportive Lemur at its day roost, in a very nice against the light aspect with a halo around its head and several more Verreaux’s Sifakas high in a bare tree. Birds included the range-restricted Appert’s Tetraka, found nowhere else in the world but this national park. This one is a tricky subject, always along the forest floor and rarely unobscured. Crested and Coquerel’s Couas showed briefly but their larger cousin, the impressive Giant Coua put on a great show near the park entrance. We heard both Cuckoo Roller and Rufous Vanga here and saw our first Flatid Leaf Bugs (of the frilly white nymph phase). Later on the journey and in the middle of nowhere a lonely zebu herder was able to guide us to some Madagascar Sandgrouse. Happily the Air ‘Mad’ schedule allowed another early morning visit to La Table, a higher altitude (just) spiny forest above Tulear. It is quite different to that near Ifaty with fewer Baobabs. As the sun rose we were successful in our attempts to track down the two special birds of this particular forest, the beautiful Verreaux’s Coua and Red-shouldered Vanga. Another two birds found nowhere else in the world away from southwest Madagascar. We also managed the smart Lafresnaye’s Vanga this time as well, including a bird gathering nesting material but again sadly we could see continued evidence of habitat destruction here in the form of charcoal making including people cutting the trees the couas like to nest in. Our next flight, back to Tana was more or less on time, however, we needed to be on standby just in case as we knew with the flight from the previous day cancelled there would be a lot of folks trying to make it to Tana and Air ‘Mad’ are notorious for bumping folks off their booked flight. In the end they put on another plane and all was well. It was nice to return to our Tana haven and enjoy some of our host’s homemade dry banana rum. Fantastic stuff! Yippee! Another flight schedule that worked in our favour! The morning flight to Morondava was moved back to the afternoon so we could do something in Tana. This is a bustling and sprawling city whose infrastructure was not intended to serve almost two million people and this is apparent when travelling by road, which takes an eternity to cover even a short distance. Given so little available habitat in this area the few nature reserves are absolutely rammed with waterbirds. I guess the ducks would end up in the pot quickly if they left. We visited one of them this morning, a former royal palace residence and among a throng of eight species of herons and egrets we eventually found four lovely Madagascar Pond Herons, in full breeding regalia and even indulging in some courtship behaviour. OK the light was horribly glaring by now and they were quite far away but this was at least better than sitting in an airport terminal. Also here were Madagascar Malachite Kingfisher, Hottentot Teal and Knob-billed Duck of note. We stopped at the excellent Pizza La Gastronomie for lunch, one of our favourite haunts before it really was time to go to the airport to catch the flight to Morondava. We did not land until sunset and made most of the journey north to Kirindy Forest in the dark, passing the Allée des Baobabs along the way. Our lodge there is quite lovely with a great restaurant and swimming pool! 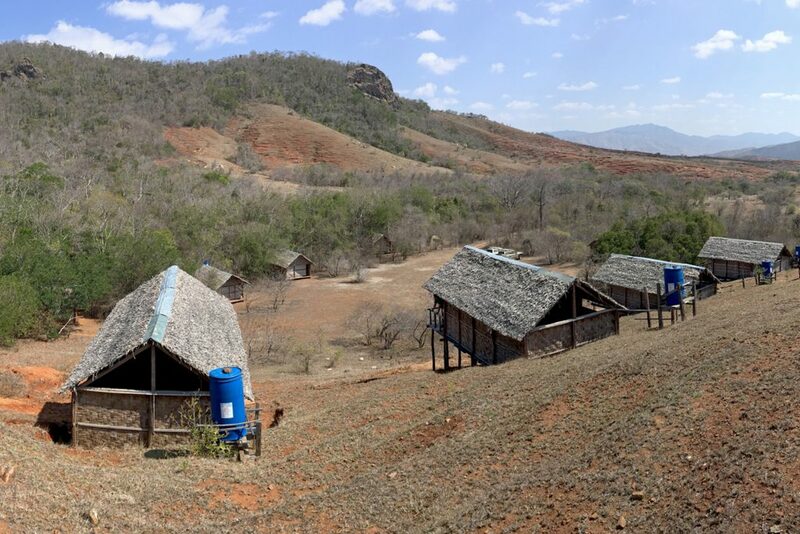 Rather than start with the fako (rubbish dump) at the forest station, we thought a nicer introduction to this wonderful dry deciduous forest would be the lemur feeding station down the road at Camp Amoreux. The lemurs were not around when we arrived, however, we had seen Fosa tracks on the road nearby and this was thought to be the reason they were not around this morning. Anyway after a while our guide located them and pretty soon managed to attract them to the feeding station where they got stuck into the Juju berries laid out for them. Red-fronted Brown Lemurs arrived first soon followed by Verreaux’s Sifakas. This is always a great portrait opportunity as well as being a lovely experience to sit so close to them. Other interesting subjects here included a Grey Mouse lemur in a tree hole, a couple of Oustalet’s Chameleons, both Crested and Giant Couas and a Mahafaly Snake fished out of one of the toilets at the camp. A lovely Vanilla vine was in flower in the forest as well. We made our first visit to the forest research station in the afternoon and bingo! Fosa! Again gnarly old male with worn out canine teeth but we got some quite nice low angle photos of him as well as a little tree climbing. Inevitably he headed for the fako where he polished off two dead rats and a chicken. Yeuch! 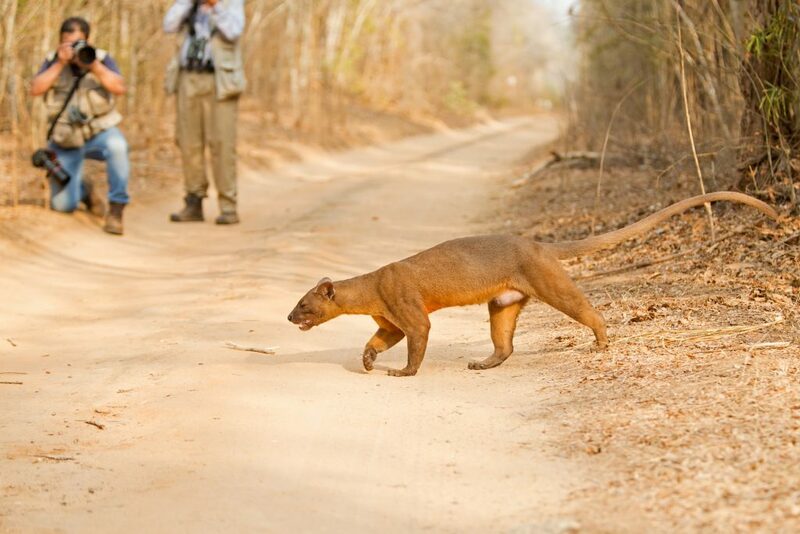 Fosa is a unique carnivore, sharing traits with cats, dogs and mongeese and the only predator in Madagascar capable of preying on adults of any of the lemurs. It is thought to have evolved from a single mammalian ancestor (along with the other Madagascan carnivore members of the family Eupleridae), which made the crossing of the Mozambique Channel on floating vegetation, long after Madagascar had split from the mainland c.150 million years ago, at a time before mammals had evolved of course. Such an event is thought to have produced all of the lemurs, tenrecs and Madagascar rodents, each family deriving from a single refugee. This might sound an unlikely way to have produced the present set of mammals in Madagascar but even one million years is a long time for something like this to happen! Remember that a primate has now managed to reach the moon (probably). Faced with a vast unexploited area of habitat the colonists radiated into an array of specialists, each finding their own niche. The other two very special mammals of Kirindy Forest – Giant Jumping Rat and Madame Berthe’s Mouse Lemur (the world’s smallest primate) proved more difficult to photograph with only record shots to show for our efforts. Up to three rats were seen on each time we tried for them, hours after dark but they would not allow closer approach by such a large group. Easier to shoot in the forest were Red-tailed Sportive Lemurs at its roosting tree as well as a few birds including Giant, Coquerel’s and Crested Couas, Malagasy Turtle Dove, Torotoroka Scops Owl, Rufous Vanga and White-breasted Mesite along with the more common and widespread bird species. We also had a great encounter with a Malagasy Giant Hognose Snake in the afternoon sunshine one day, it was around 1.5 metres long. Night walks also produced some interesting subjects like Pale Fork-marked Lemur and Grey-brown Mouse Lemur as well as Madagascar Ground Gecko and a Large-clawed Scorpion. We very much enjoyed our time at Kirindy. It was wonderful to see so much lowland deciduous forest still remains here. The ideal lenses at Kirindy were again 70-200 and 100-400. Returning south to Morondava we paused to admire the magnificent baobabs along the way. First of all we visited the Baobabs Amoreux, two Western Baobabs (Adansonia za), which have become intertwined, like lovers, hence their name. The trees have become a natural monument and are now included on most list-ticking tours of the area. They are very impressive nevertheless. A little further south lies the Avenue of Baobabs or L’allée des Baobabs. A group of around 25 impressive Grandidier’s Baobabs, some around 900 years old and 30m tall. The dirt road through the trees is unfortunately totally infested with vahaza (a term of endearment meaning white tourists) and now some new red and white tape and lighting housings have appeared as well so it is difficult to get any kind of photo without someone or something you don’t want in the frame. However, there are another 20 or so Grandidier’s Baobabs in the surrounding fields, which are just as impressive. The avenue is not protected nor has any formal entry or viewing arrangements being along a public road but the trees have been preserved out of reverence for them. Their soft, water storing centres mean that they are of little use for building material, which obviously helped their survival. A brief stay in the seaside town of Morondava was very enjoyable at a lovely hotel resort and a walk on the beach next to it produced a few shorebirds, particularly Lesser and Greater Sandplovers, Sanderlings and whimbrels. A flotilla of make-shift sailing craft set out to sea here every day to fish the offshore waters. Some of us explored a local market instead but were happy to escape soon! One particularly memorable moment was 70s disco anthem ‘I Feel Love’ playing on the sound system and the local Madagascar Nightjar starting up at the same time and singing over the top of Donna Summer, truly surreal! Our flight back to Tana was uneventful and we were able to set off east from the capital in time to reach Perinet by late evening (too late for a night walk sadly) but not before we had picked up a Pizza La Gastronomie takeaway, even including ice cream! Frighteningly little original forest remains along route two until you get to Perinet, any substantial woodland until this point is eucalyptus and of little use to native wildlife. With one night fewer at the former French railway hill station of Andasibe we had to get cracking quickly so we decided on a visit to the primary rainforest of Mantadia National Park on our only full day there. After bumping our way a horrible jeep track for well over an hour we finally reached our chosen trailhead into the forest and before long our excellent local guide had come up trumps with a Madagascar Pygmy Kingfisher and then a pair of the fantastic Scaly Ground Roller, not far from the car park! This is a difficult bird to see let alone photograph so, after some initial cat and mouse manoeuvring we were delighted to be able to watch one of these terrific birds in a situation where everyone could blast away at it for several minutes. OK it was against the light but it would be ungrateful to complain about this. We had already talked about manual exposure settings for days now after all. Other very special creatures in Mantadia included the awesome Black-and-white Ruffed Lemur. We were able to watch the same family group a couple of times and on the second occasion they came down a bit lower in their feeding tree for better photos. We did not need any more co-operation from the incredible Diademed Sifaka, a pair of which was seen down at eye level for what seemed like ages and certainly long enough to change to a shorter lens to get them all in the frame! Definitely one for the ‘Fab-u-lous’ category and much more satisfactory than seeing the marooned transplants on the Vakona river islands back at Andasibe! The afternoon session also saw us shooting Red-bellied Lemurs in the trees above us, the males with their weird bare cheeks. Our final lemur, for some, was a magnificent Indri, sitting just above the trail for a while before bouncing off the tree trunks and away into the distance. For those who stayed in the car park the crazy Giraffe-necked Weevil and Lined Day Gecko were available. Other noteworthy birds in Mantadia incuded Tyla’s and Nuthatch Vangas, Long-billed Bernieria, Forest Fody, Nelicourvi Weaver and Common Newtonia among others. What an excellent day we had here! On returning to our accommodation we were able to watch a group of Common Brown Lemurs at close quarters before we headed out on our single night walk here. Four species of chameleons lifted macro king Paul’s spirits and included the impressive Parson’s as well as Brown Leaf Chameleon, our first of the genus Brookesia. We also saw Betsileo Reed Frog, a couple of Goodman’s Mouse Lemurs and a single Furry-eared Dwarf Lemur but the lemurs were rather uncooperative. Time was running out on the main tour and on the final day we had a very special animal on our agenda (particularly for those who had missed it at Mantadia), the critically endangered Indri, the largest extant lemur. It is unique in not having more than a stump for a tail but this does not seem to hinder its amazing ability to make massive 10m+ leaps through the trees. They mate for life and live in small family groups in the forest, where they are exclusively herbivorous. Although their appearance is as endearing as a furry black-and-white teddy bear probably the most amazing thing about them is their voice. As we hiked through the forest we could hear the sound of their mournful off-key voices, ringing through the trees long before we got anywhere near them. The family groups usually sing to each other, each chorus lasting only a few minutes, after which they fall silent again. We saw and heard them in several places but always with Indri tourist vahaza in hot pursuit, some more considerate than others. As usual with Indri it was not that straightforward to shoot them in an unobscured situation with their lovely large green glassy eyes lit by the sun! The second outstanding encounter today was with a pair of Colllared Nightjars scouted by one of the local guides. ‘They are somewhere within two metres of you’. It was surprising how long to took one of our folks to spot their weird form, looking like a two-headed bird in the leaf litter of the forest floor. As we left the Indri reserve we dodged crowds of vahaza pointing their cameras at a couple of Diademed Sifakas (reintroduced here). After some deliberate motion blurs it was definitely time to go. Our adventures in the east came to an end and it was time to head north. After another delayed and very bumpy flight to Antsiranana (formerly Diego Suarez) including the pilot aborting his first landing attempt(!) we embarked on our longest road (if you can call it that) journey of the tour. The adverts for kite surfing holidays all over the airport terminal were a clue. This was windy season and there were some clouds in the sky at last too! The journey took 12.5 hours driving this time to cover c.235km, often at a snail’s pace on dusty, deeply rutted tracks. Unfortunately there had not been any road repairs since the last rainy season and that had included a cyclone, which had turned an already very poor situation into a farce. There were millions of tiny detours where local folks had cut new routes around impassable sections and had made small barriers where they asked for a toll to be paid. We arrived at remote Daraina after midnight and the following day was another first for me, two evening meal in one day. Our lovely camp staff had stayed up for us and cooked us a meal, which we ate at 1am! The northeast corner of Madagascar has been subject to a gold rush in recent years and we passed by numerous small villages, which have sprung up along the road to Vohemar, each surrounded hillsides pock-marked by tiny individual mines and their spoil heaps. Fortunately the gold here is of very poor quality or the destruction would be far worse. The reason we made such an effort to reach this remote area was to see the beautiful and critically endangered Golden-crowned Sifaka. We didn’t bother with the gold mining area this time and stuck to the lovely forest adjacent to the NGO Fanamby’s Tattersalli Camp, where the sifakas were ever present and easy to see. Again it proved to be much more productive and pleasant than the gold digging area being almost pristine, with little evidence of tree cutting. Our encounters with Golden-crowned Sifakas here were simply stunning again. They seemed to follow a pattern of coming down to the camp area to feed in the late afternoon sun. Beautiful! We counted a minimum of 27 sifakas in 5 separate groups including one baby and we also caught up with the (merely) endangered Crowned Lemur, including up to eight animals together, feeding in trees around the camp. Night walks were again productive here too with Daraina Mouse Lemur, Daraina Fork-marked Lemur and Daraina Sportive Lemur, which we also had simply jaw dropping daytime views of. Sadly we were not successful in our quest for the Aye-aye again, although we did find recent workings on tree trunks. A big effort by the local boys to find one for us was not succesful. Maybe we will have to admit defeat and simply visit the transplants marooned at Palmarium next time? Bird life was also more obvious in such nice forest here, with noisy flocks of Greater and Lesser Vasa Parrots roosting in the forest, which were spooked occasionally by a Madagascar Buzzard. Madagscar Nightjars flew around the camp in the twilight, Rainforest Scops hooted away after dark and Madagascar Harrier Hawks were also in evidence, their calls echoing across the forested slopes. Passerines included Blue Vanga, Madagascar Hoopoe and Long-billed Bernieria but the forests were generally quiet. Tattersalli Camp itself is very simple but is clean and delightfully located right on the edge of the forest. There was even running water this time (well from a bucket above the shower/bathroom section of our huts) and the staff fed us very well with some tasty food with no unwanted side effects! I hope that some of you reading this will be inspired to visit it and in doing so help preserve the forest surrounding it. The effort to reach Daraina is still worthwhile. Retracing our journey back to Diego Suarez we stopped off for a roadside Panther Chameleon, somehow spotted again by our amazing driver Nunu! Montagne D’Ambre, an attractive former French hill station overlooking the coast. The mountain itself is named after the resin of the trees found there. Our accommodation here was really delightful, again one of the best of our time in Madagascar, as was the food! Very welcome after the simple country life in Daraina. Our night walk here was also one of the best of the tour. 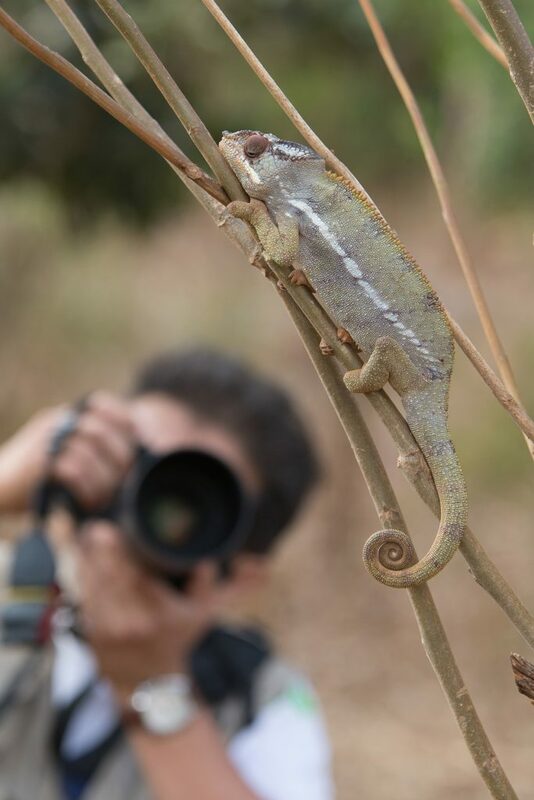 Our local guide showed us some great new chameleons – Petter’s (with its crazy ‘false teeth’) and Panther. We also saw the amazing Giant and Mossy Leaf-tailed Geckos – a visit to Madagascar would not be complete without one of these creatures. Thanks to another schedule change by Air ‘Mad’, who were unintentionally very kind to us this year, we had a morning to spend on Mount Amber. Get in! Our local guide in the National Park certainly knew where to find the special creatures and although we missed a Ring-tailed Vontsira literally by seconds in the car park at the picnic area we tallied an excellent list of specialities. First came Mount Amber Rock Thrush, followed by Mount Amber Leaf Chameleon (the world’s second smallest chameleon!) and then the much larger and elephant-eared Mount Amber Chameleon itself. This was followed by a Nose-horned Chameleon and finally a big Arthur’s Chameleon to complete our chameleon fest. What a way to end the tour! We even had time to check out the Antsirinana Pizaa La Gastronomie before taking the flight back to Tana and going our separate ways. Finally I must thank all of our guides and drivers in Madagascar, without whose help and determination often in difficult circumstances we would not have seen nearly as much of its wonderful wildlife! Mike Watson lives in East Lancashire with his Hungarian partner Évi and their son Alexander. 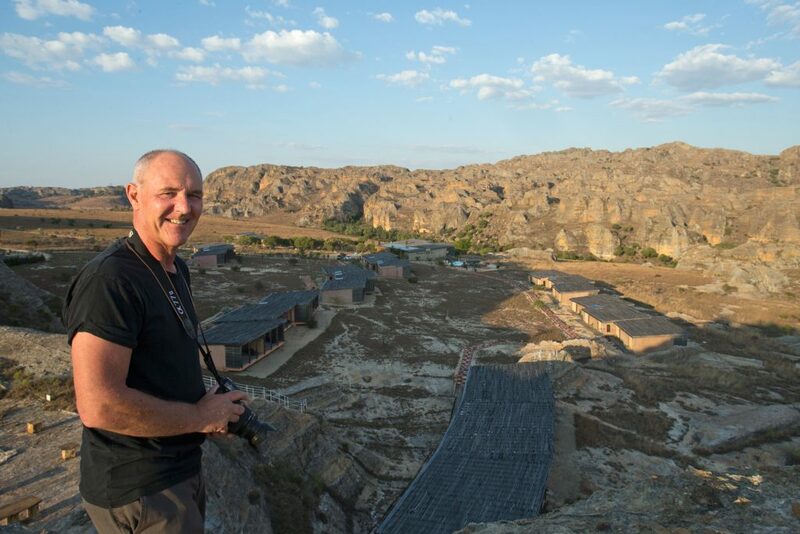 Mike has been an avid photographer for more than 25 years and spends most of his spare time with camera in hand. A keen wildlife enthusiast since childhood, his sharp eyes will surely ensure some great wildlife encounters! Mike is a very approachable guide and always willing to share his photographic knowledge with participants on his tours.